The SOLAR CHILL solar powered evaporative cooling system is available in five sizes and 2 DC volt- ages(12, and 24 volts DC). The rust-proof housings are built of 304 stainless steel, and use a 6" thick fluted pad as the wet cooling media. This pad is the most efficient evaporative cooling media in the world, and it will last five years with minimal maintenance. SOLAR CHILLs use only 25 to 130 watts! 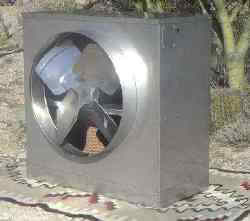 Only 80 Watts for 4500 cubic feet per minute (CFM). Use the 24" or 2-20" if the cooler will be connected to ductwork. Optional rheostats may be used to slow fan speed. Optional Control Packages with clean out pumps are available. Dimensions H" x L" x W"